Home / Uncategorized / After 2009, why could 2015 deliver a climate deal? The phrase “the benefit of hindsight” has been ringing in my ears as I’ve been reading the reports from the close of the Durban climate negotiations late on Saturday night. In particular, it’s been ringing in my ears as I read that we’re now aiming to get a global deal in 2015. The question I’ve been asking myself is – if we got it so wrong in 2009 for a global deal in Copenhagen, why would we manage to do so in 2015? Even if Durban agreed the language “protocol, legal instrument or agreed outcome with legal force”, applicable to all countries including China and the US, does that really make any difference? What could make 2015 special? Before I go into why 2015 might be special, I should be clear that I don’t believe Copenhagen or Durban were failures. Having been in Copenhagen to see the many Ministers and Leaders committed to getting the best deal possible, and knowing just how tirelessly negotiators work – as Durban has also demonstrated, I do think there were some key initial commitments that we should be grateful for: the commitment to a 2 degree goal; the Green Fund; the voluntary and transparent emissions reductions pledges from a wide range of countries; and many more. Nevertheless, as the report by UNEP published just before Durban made clear, even if those commitments were a step in the right direction, they were and remain insufficient. And they’re certainly not enough to satisfy countries such as the Maldives who continue to argue for a significantly stronger 1.5 degree goal. So what might make politicians now, post-Durban, believe that 2015 can actually deliver even more action, through a global deal that involves all the major carbon emitters, such as the US, China, EU and India? Is it worth building up the pressure again? I think there are three conditions that mean 2015 does have significant potential, particularly in comparison to 2009. First, the year before 2015, the fifth comprehensive report from the Intergovernmental Panel on Climate Change (IPCC) will be published. Many people have cited the Montreal Protocol as the most successful environmental treaty. The actions countries took through the Montreal Protocol were in direct relation to ever-stronger evidence on the depletion of the ozone layer. In 2015, the climate negotiations could well respond directly to the science on the greenhouse gas effect, which is continuing to intensify. Second, by 2015 a very wide range of countries – from China to Malawi – will have made strong strides in testing the hypothesis that they can grow at the same time as reducing emissions. China’s current 5-Year Plan includes a target to reduce its emissions intensity per unit of economic growth by 17% by 2015. By 2015, it will know how close it is to that target, as well as the effects on its economy from doing so. Similarly, India will be well on its way to installing a target of 20GW of solar energy by 2020, gaining understanding of whether it is capable of growing and reducing poverty while avoiding dependency on coal imports, as it is currently projected to do unless it takes these kinds of steps. Malawi, Mexico, Costa Rica, Ethiopia and Rwanda are just a few other countries that will also have begun to really test whether green growth works in their diverse set of economies. Third, the Millennium Development Goals will have expired, and countries around the world will be contemplating a new global framework for addressing poverty reduction and other global economic challenges, hopefully including climate change. Therefore 2015 has the potential to mark a major shift in multilateral co-operation. The benefit of hindsight tells us that none of these conditions was close to being satisfied in 2009, nor were they in 2011 by the Durban conference just gone. In 2009, the fourth IPCC assessment report had spurred the agreement of the Bali Action Plan two years prior to Copenhagen. In 2009, only developed countries had made promises to reduce emissions, or significantly incorporate climate change into national planning. In 2009, the US had just elected a new President, who trod carefully in order not to create immediate upset domestically. 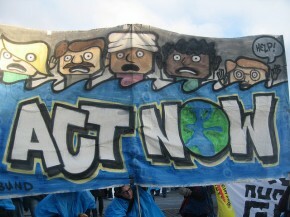 In 2009, the world had little experience of what kinds of actions could be taken to respond to climate change – aside from emissions trading and carbon taxes. Since then, according to the OECD, public funds provided to developing countries to reduce carbon emissions have increased by almost 70%. These funds and the actions they are stimulating will provide crucial lessons about what works and doesn’t. Making predictions is wrought with problems. As the Economist says in assessing its own predictions for 2011, predictions are only a best guess of the future. We should probably avoid being too bullish, or creating too much pressure as we did for Copenhagen. Expectations were relatively low for the Durban climate conference –yet it has delivered, in the words of Chris Huhne, “a very significant step forward“. But if I can make one guess, it’s that the economics of climate change may well be considerably stronger in 2015 than in 2009, and that might just make for a major deal.